Make a delicious dip either containing veggies or to dip your favorite vegetables into. This page contains vegetable dip recipes. I found this recipe in a most unusual place - on the back of a packet of seeds! I bought a package of Trionfo Violetto beans, an Italian bean that is a lovely, deep violet color. When cooked, they don't retain that color, but they are delicious. I don't normally submit a recipe that isn't my own unless the cook book is very old or rare, or the source is so unusual most people won't have access to it. 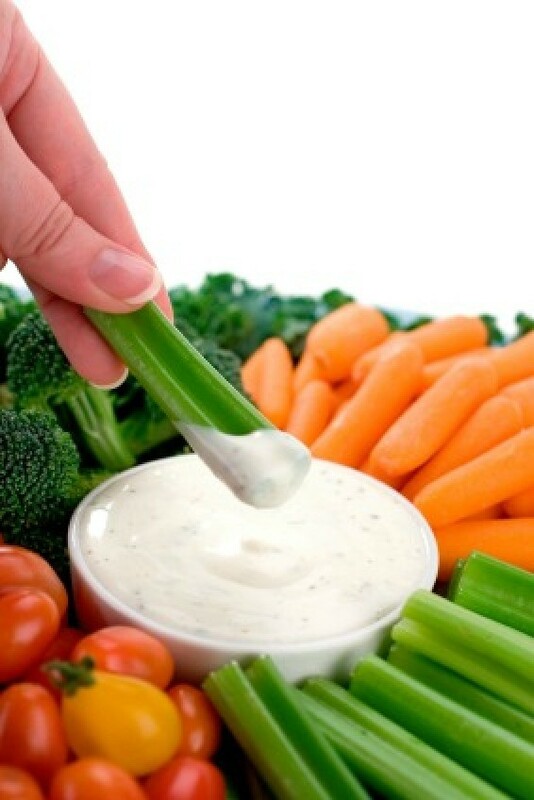 This recipe is just delicious for dipping veggies. If you have never made homemade mayonnaise, it is worth the trouble. It is lighter and more flavorful than store bought, with a silky texture. But your favorite store bought will do just fine. Cook the beans in boiling water for 3 minutes, rinse in cold water, and set aside. Mix all dip ingredients well. Chill for a few hours. Serve with the green beans, or with a variety of pared veggies. Combine all ingredients in a blender and process until smooth. Transfer to a small bowl and serve with vegetables. Combine all ingredients into a small bowl and stir until thoroughly combined. Chill before serving with carrots, celery, broccoli, and other cut-up vegetables. Mix all ingredients well. Can chill and serve at a later date or can serve immediately. Bring cream cheese to room temperature. Place in 1 cup glass measure or small microwave dish. Microwave on high 30-45 seconds just till cream cheese is getting warm. Stir in bouillon granuals till mixed and add just enough milk to thin out cream cheese. It usually takes about 2 Tablespoons. Microwave 15 seconds longer till cream cheese mixture is smooth. Refrigerate till cold about 2 hours, Serve with vegetables for dipping or crackers. Mix ingredients and chill. Serve with fresh bite-sized veggies. Mix. Arrange raw veggies on tray around dish of dip. Blend all ingredients thoroughly. Chill. Soften cream cheese. Add dressing mix. Slowly add buttermilk. Add rest of ingredients. Beat until smooth with wire whip. Yield: 1 quart. One of the best dips I have ever tried. Good with chips, also. Great dip for veggies or chips! Blend with mixer. Serve with fresh veggies. Combine all ingredients mixing well. Place in a ziplock bag. Use within 6 months. Makes 2 Tbsp. This dip is sure to be a hit at your next party. It tastes great with fresh veggies, crackers, or chips. This delicious party dip is great for dipping chunks of bread or fresh veggies.